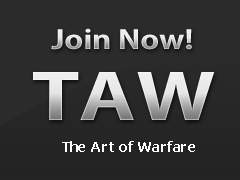 The basic unit of The Art of Warfare (TAW) is the Division. There are two varieties of divisions: Army Divisions and Support Divisions. This article specifically focuses on Army Divisions. A Division is led by a Division Commander who is supported by a Division Officer. These leaders work as a team to manage the day-to-day operations of their division. A Division is broken up into a number of smaller units known as battalions. Most often members join a battalion based on compatible practice times. This also often results in members from similar time zones congregating into the same battalion. Each battalion is led by a Commanding Officer that is in charge of the entire battalion. Other officers in the battalion include the Executive Officer, and Staff Officer. Together all three of these officers ensure the administrative aspects of the battalion run smoothly. The battalion also has a number of Field Leaders that manage the combat and training aspects of the battalion operations. These include the Field Specialist, Squad Leader and Drill Instructor just to name a few.